When Manhattan Pres was being planted in the Fall of 2013 we were looking for a great recipe for our Lord's Supper bread. We wanted it to be great, to draw our minds and taste buds to what a meal at the table of the Lord Jesus Christ might be like. We can't even begin to match the reality we'll experience in the future, but our bread is pretty much the best communion bread ever! 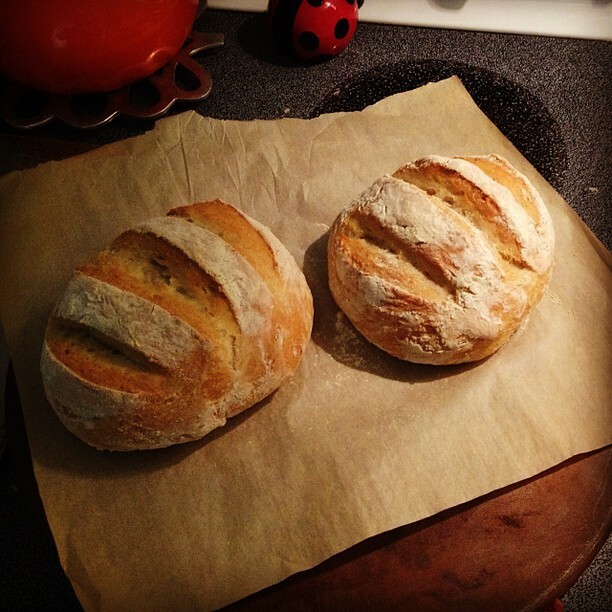 We tried a number of recipes in the process and eventually found this Rustic Crusty Bread. Once we made this bread the searched ended. It's been fun to have different families make it for the service. Word is it's not difficult to make and has tasted great from everyone who has made it. To make transfer of recipe easier I wanted to post it here. You can also see the whole step by step process with pictures on Mel's recipe page here. Christine adjusted the recipe with wheat gluten and it made it softer. If you don't have that ingredient, no worries, it works without too. Look at the last paragraph of the recipe for variations to baking if you don't have a baking stone. Also, check below the recipe for step-by-step pictures. In a large bowl mix yeast, gluten and salt into 3 cups lukewarm water (about 100 degrees). Stir in flour, mixing until there are no dry patches. Dough will be quite loose. Cover lightly with a kitchen towel but don't seal the bowl airtight. Let the dough rise at room temperature 2 hours (or up to 5 hours). Bake at this point or refrigerate, covered in an airtight container, for as long as two weeks. When ready to bake, cut off a grapefruit-size piece with serrated knife (I have only ever made two loaves out of the batch of dough so I just divide the dough in half to form my first loaf). Turn the dough in your hands to lightly stretch the surface, creating a rounded top and a lumpy bottom. Put the dough on a piece of parchment paper set on a pizza peel or a rimmed baking sheet turned upside down. Let the dough rest for 40 minutes for room temperature dough; if you have used the dough out of the refrigerator, let it rest for 1 1/2 hours. Repeat with remaining dough or refrigerate it. Place a broiler pan on the bottom rack of the oven. Place a baking stone on the middle rack and preheat oven to 450 degrees. Heat the stone at that temperature for 20 minutes before baking. After the dough has rested and is ready to bake, dust the dough lightly with flour, slash the top with serrated or very sharp knife three times. Slide the dough (with the parchment paper) onto the baking stone. Pour one cup of hot water into the broiler pan and shut the oven quickly to trap the steam. Bake the bread until well browned, about 24-28 minutes. Cool completely. If you don't have a baking stone, try turning a rimmed baking sheet upside down and heating it in the 450 degree oven for 10 minutes prior to baking. When ready to bake, slide the parchment paper with the dough on it directly onto the overturned baking sheet and bake according to the recipe. You can also stretch the rounded dough into an oval and place in a greased loaf pan. Let it rise for 40 minutes if fresh (add an extra hour if the dough has been refrigerated). Bake in the loaf pan in the 450 degree oven, watching the time carefully - check after 20-22 minutes.